An armed robbery suspect was shot early yesterday morning by a rookie police officer following a brief car chase. 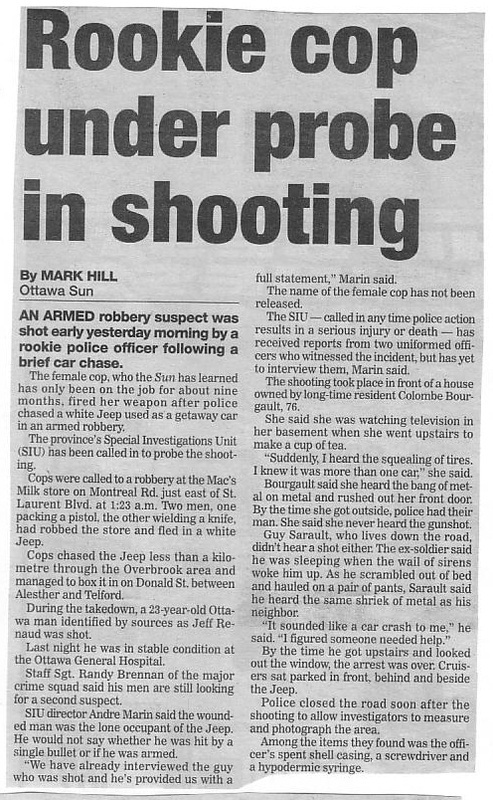 The female cop who, the Sun has learned, has only been on the job for about nine months, fired her weapon after police chased a white Jeep used as a getaway car in an armed robbery. The province's Special Investigations Unit (SIU) has been called in to probe the shooting. Cops were called to a robbery at the Mac's Milk store on Montreal Road just east of St. Laurent Blvd. at 1:23 a.m. Two men, one packing a pistol the other wielding a knife, had robbed the store and fled in a white Jeep. Cops chased the Jeep less than a kilometre through the Overbrook area and managed to box it in on Donald St. between Alesther and Telford. 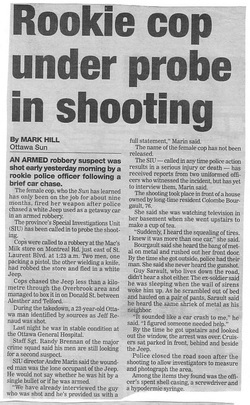 During the take-down, a 23-year-old Ottawa man, identified by sources as Jeff Renaud, was shot. Last night he was in stable condition at Ottawa General Hospital. Staff Sgt. Randy Brennan of the major crime squad said his men are still looking for a second suspect. SIU director Andre Marin said the wounded man was the lone occupant of the Jeep. He would not say whether he was hit by a single bullet or if he was armed. "We have already interviewed the guy who was shot and he's provided us with a full statement," Marin said. The SIU — called in any time police action results in a serious injury or death — has received reports from two uniformed officers who witnessed the incident, but has yet to interview them, Marin said. The shooting took place in front of a house owned by long-time resident Colombe Bourgault, 76. She said she was watching television in her basement when she went upstairs to make a cup of tea. "Suddenly, I heard the squealing of tires. I knew it was more than one car," she said. Bourgault said she heard the bang of metal-on-metal and rushed out her front door. By the time she got outside, police had their man. She said she never heard the gunshot. Guy Sarault, who lives down the road, didn't hear a shot either. The ex-soldier said he was sleeping when the wail of sirens woke him up. As he scrambled out of bed and hauled on a pair of pants, Sarault said he heard the same shriek of metal as his neighbour. "It sounded like a car crash to me," he said. "I figured someone needed help." By the time he got upstairs and looked out the window, the arrest was over. Cruisers sat parked in front, behind and beside the Jeep. Police closed the road soon after the shooting to allow investigators to measure and photograph the area. Among the items they found was the officer's spent shell casing, a screwdriver and a hypodermic syringe.